Sony Ericsson may not be good at delivering promised goods in a timely manner, but when it does finally deliver something—say, its first HSDPA phone for the US market—it does it with style and a shockingly low price. The Z750a is hitting AT&T for just $50 (after a $100 mail-in rebate that you damn well better fill out). The clamshell with the signature-Sony OLED see-through exterior will come in three colors: Mysterious Purple, Phantom Grey and Rose Pink. US availability details and bonus pic after the jump. RALEIGH, N.C. —(Business Wire)— Mar. 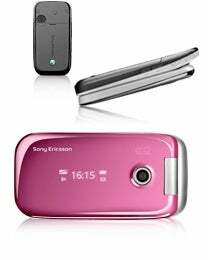 31, 2008 Mobile phone owners no longer have to decide between high performance and attractive design when choosing a new handset with the new Sony Ericsson Z750a. Available in the U.S. exclusively at AT&T, the Z750a is an affordable and stylish handset with a mirrored clamshell design and a hidden exterior display that illuminates when the phone is in use. As Sony Ericsson's first 3G/HSDPA handset for the U.S. market, the Z750a features mobile broadband for a high-speed Internet(1)connection and access to multimedia content that complements its multimedia player, 2.0 megapixel camera, Internet(1) browser and e-mail(2) capability using AT&T's Mobile Email application. "Sony Ericsson continues to expand its North American portfolio with a distinctive and signature design that combines entertainment, style and speed in a sleek device," said Karen Morris, vice president of marketing for Sony Ericsson North America. "Representing one of our most distinctive and colorful 3G clamshells, the Z750a will appeal to those who want to do more with their phone - share music, high-quality pictures, browse the Internet - and project a sophisticated image all their own. We are delighted that AT&T will offer this device in the U.S. along with the hugely successful W580 Walkman(R) Phone." The Z750a works hard, offering features such as data download transfer speeds from 600 to 1400 kbps from AT&T's High Speed Packet Access (HSPA) 3G network, support for AT&T's Mobile Email, a 2.0 megapixel camera, full HTML web browsing(1) capabilities and stereo Bluetooth(R)(3) support (A2DP). The Z750a also plays hard with 3D gaming capabilities, a media player that supports numerous media file types for listening to your favorite music tracks and video. The phone has up to 26MB(4) of internal memory and is Memory Stick Micro(TM) (M2(TM)) compatible - currently upgradeable to 8GB(5) - providing ample storage space for photos, videos, music, games and more.